Eager Apple fans have lined up for the newest iPhone in numbers comparable to previous years, leading some analysts to believe that launch weekend sales for the device will be at or above what they were for last year's model. Looking at lines in New York, Minneapolis, and San Francisco, Piper Jaffray analyst Gene Munster found them about equal to the lines ahead of the iPhone 5's launch. 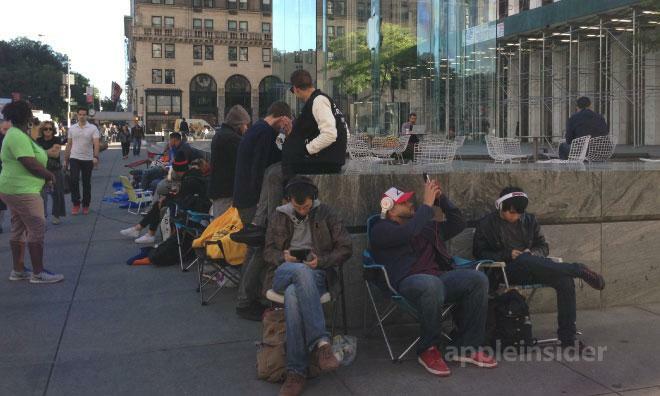 While this year's lines are actually longer  with more than 1,800 people queueing at the 5th Avenue and Upper West Side Apple Stores  Munster attributes this in part to the lack of a preorder period for the iPhone 5s. Given the length of the lines, Munster expressed confidence in Jaffray's previous estimate of between five and six million iPhones sold over the launch weekend for the two devices. The firm's price target for AAPL shares is $640, with a CY14 earnings per share estimate of $45.70. Munster's estimate is conservative compared to that of KGI analyst Ming-Chi Kuo. Kuo said in a note to investors that Apple will likely ship between six and eight million new iPhones over the first weekend of sales. Long lines at Apple's retail stores and at carriers may allay some investor fears that Apple had underwhelmed consumers in revealing its newest generation of smartphones. Those fears were compounded by Apple declining to announce presale totals for the iPhone 5c when that device became available. Some observers took Apple's silence to indicate soft demand for the polycarbonate-backed 5c. Subsequent surveys, though, found that demand was strong for both the 5c and the 5s, and the queues in front of Apple Stores appear to bear out those results.